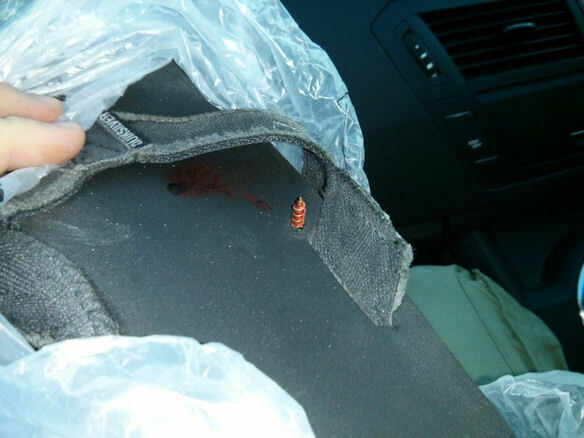 Why you shouldn’t screw your flip flops to your feet! A pretty drastic way of ensuring that you prevent your flip-flops from falling off is to screw them on! This week hasn’t quite turned out as planned. For one, yesterday morning I had to manually remove a No.8 (40 mm) screw from the bottom of my foot and go to hospital for a tetanus booster injection. Reuben and Joshua have been on holiday from school since Wednesday, and as they have repeatedly asked if they could have ‘a sleepover’ a Grannie in Selkirk’s I took these three days off too and planned with my Mum to head down yesterday morning (which would also have been my Dad’s 69th birthday). The plan was to take a leisurely drive to the Scottish Borders and then spend the day showing them a bit more of Selkirk: where I grew up, where I played, where I went to school, and also to visit my Dad’s grave and lay some flowers to mark his birthday. I was woken around 06:20 by Reuben leaping onto my bed. “When are we going to Selkirk? !” were his first, excited words. “After breakfast,” I replied getting out of bed. I still had to throw a few things into a bag but first, looking out of the bedroom window into the backyard, I realised that the bin needed to go out—the paper-recycling lorry would be round soon. After a quick detour to my study to pick up an R-kive box that I use for storing paper to be recycled we tripped downstairs and as Reuben and Joshua got comfortable at the breakfast bar I said I’d just be a minute and I headed outside into the cold, pulling on a jumper. I stepped across the stones and tipped the contents of the R-kive box into the grey wheelie bin before I started to pull it towards the gate and the main road. I stopped. The back door was still open. I reached over and pulled it closed, only to turn around in time to see the wheelie bin tipping over and spilling half its contents into the backyard. “Oh no!” I groaned righting the bin and then getting down on my hands and knees and scooping up handfuls of scraps of paper that were now being blown around in little eddies around the yard. I looked over at the R-kive box. Surely it would be quicker if I scooped the paper into that: less distance to travel. I stood up, stepped across the gravel and reached out for the box, sitting on top of the blue general waste bin. I stepped on something sharp; stones likely. I lifted my right foot and gave it a shake. It was common for small stones to slip beneath my foot and my flip flop. I heard a few stones fall out and click on the gravel beneath. I put my foot down and quickly lifted it again. A sudden fear went through my mind: something has gone into my foot. A sharp stone? There’s a sharp stone embedded in my foot! It seems to have gone through my flip flop too. The paper continued to blow around the enclosed backyard. I needed to clear that up first and as I couldn’t exactly walk without pain anyway I dropped to my knees with the blue and white R-kive box and crawled across the gravel to the paving stones. I could feel the panic rising within me. “Joshua!… JOSHUA!” I screamed. The back door was still ajar; it hadn’t closed entirely. I frantically scooped up the paper into the box: scraps of A5 notepaper, newspapers, food packaging. Joshua ran off as I closed the wheelie bin lid, turned around as carefully as I could and tried to make my way into the house. The pain was excruciating now. My sense of panic was growing. I held onto what I could grab and I began to hop up the steps and in through the back door. “I’m coming!” I heard her reply, sounding slightly irritated. Jane was recently diagnosed with spondylolisthesis, a back condition that has left her in a lot of pain herself. She had spent much of the night squeezed into Isaac’s bed beside him and she was struggling to get out of bed. I collapsed onto the sofa in the kitchen as Jane arrived. “I think I’ve stood on a sharp stone,” I said quickly. “I think it’s gone into my foot.” I was beginning to go into shock by this point. And the pain was so intense that I felt like I might pass out. It was a screw. It turns out to have been a No. 8 (40 mm) Pozidriv screw. As my colleague Steve confirmed later: those are the painful kind! Jane couldn’t get a grip on it. “I think I may need to cut your flip flops off,” she apologised. “Do it!” I said. I’ve watched Casualty on TV: I know how it goes. After another failed attempt I realised that I was going to have to do it. I’ve often prided myself on such a strong grip. I didn’t realise that one day I would have to manually unscrew a No.8 from the bottom of my foot! I sat up, took a deep breath, crossed my legs and took a closer look. I felt sick. If a man, trapped in the mountains can saw his own arm off using a Swiss army knife, I found myself thinking, then I can remove a screw from my foot. I considered at this point of sending for my Black & Decker electric screwdriver. At least it has buttons to differentiate between in and out. I grasped the screw head tightly between by fingers and began to turn it anti-clockwise. It was coming out! It was coming out! Just over an hour later I was sitting in a treatment room at the minor injuries unit in St Andrews community hospital having the wound washed out and getting a tetanus booster injection to my arm. An hour because we’d phoned NHS 24 for advice and well… they promised to phone back within three hours(!) and I couldn’t wait any longer; and Jane had phoned her parents asking if she could quickly drop the boys off at theirs so that she could drive me to the hospital and her dad had insisted that they be dressed first… and they really weren’t up for playing that game. Forty-five minutes to get three dressed on a non-school day was actually pretty good going, compared with other attempts. So the trip to Selkirk was postponed, I got my pain relief under control, and I sat with my leg up for most of the day. Today it really hit me: I felt floored, I had no energy, I slept a lot. Tomorrow… well, I think I have an infection brewing. I’ll be phoning the doctor first thing. My mum recommends Listerine original for infections of the feet, but my local chemist only has mint or anti-cavity. Posted on Thursday 13 February 2014 Thursday 14 December 2017 Categories FamilyTags foot, hospital, injection, injury, Joshua, Mum, Reuben, screw, Selkirk, tetanus, trip1 Comment on Why you shouldn’t screw your flip flops to your feet! 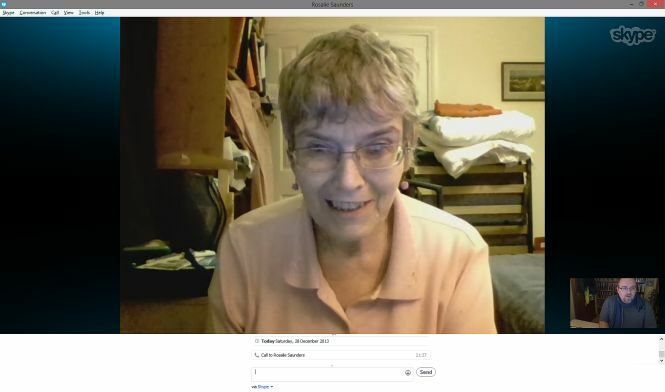 My Mum on Skype, earlier this evening. This morning we got up early, carefully removed the roof box (it turns out that if the wind gusts above 50 mph then cars with roof boxes will be prevented from crossing the Forth Road Bridge… and we didn’t want to take any chances), packed the car and headed south, just as the sun was beginning to rise. Destination: Selkirk. And more specifically, the my-Mum’s-house part of Selkirk. We were delivering presents and catching up, albeit too briefly, with relatives. There are some members of my extended family that we’ve not seen for too long; a few had not even met Isaac, who turns three next month. Not due to any conspiracy, but simply a combination of the impracticalities of small, twinsy children, lack of sleep (a lot to do with lack of sleep), depression, back/neck injuries, and… the fact that it takes us the best part of 6 hours to just drive down there and back again. So it was lovely to catch-up, albeit too briefly. On our drive back north we popped in to see my brother Eddie at South Queensferry, to get the boys into their pyjamas and to deliver another Christmas present. This year, for Christmas, we gave my Mum a new laptop computer (Asus X551CA, featuing a 15.6″ screen, Intel Celeron 1007U dual core CPU, 4GB RAM, 500GB HDD, Windows 8.1 Home). Mum has never had a new laptop. Her last-but-one was a very generous hand-me-down from good friends of ours. Her last one was bought about ten years ago for a business that Jane and her Mum ran in Edinburgh. It was creaking at the joints: it almost panted with exhaustion running Windows 7, it would take about 15 minutes to start, the cheap webcam I had bought for it had too low a resolution and would invariably find itself pointing at the ceiling when I was trying to Skype with Mum, and the speakers were too quiet, so we’d have to Skype and phone at the same time to get both video and audio. The new one, though, is fast: it boots in about a minute. It has a built-in high definition webcam and the speakers are loud enough for us to make a Skype-to-Skype conversation, as you can see form the screenshot above. It’s been a good day of re-establishing connections. Hopefully we can get back down to the Borders before too long, and can start using Skype more to keep in touch. Every week my Mum faithfully sends me the local newspaper, the Selkirk Weekend Advertiser. 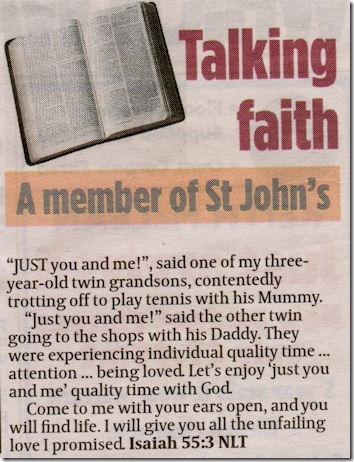 This week, on page two, was a short “Talking faith” article by “A member of St John’s” (the Scottish Episcopal Church in Selkirk). That member was my Mum, and her thought for the day ‘column’ was inspired by two of my beautiful children, Reuben and Joshua. 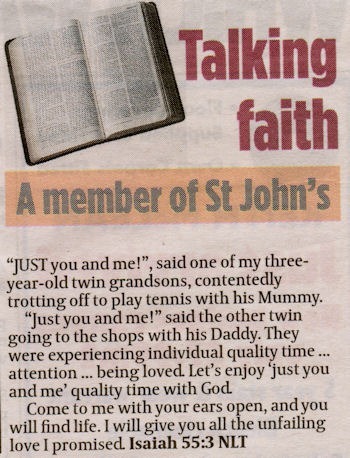 “Just you and me!”, said one of my three-year-old twin grandsons, contentedly trotting off to play tennis with his Mummy. “Just you and me!” said the other twin going to the shops with his Daddy. They were experiencing individual quality time… attention… being loved. Let’s enjoy ‘just you and me’ quality time with God.